The first best thing about these strawberry cheesecake parfaits is that they taste just like you hope they will…a little bit strawberry, a little bit cheesecake, a whole lotta delicious. The second best thing about them is that you can make them in (I’m not kidding) about 15 minutes. No baking. No waiting. Just quick and pretty little parfaits with no muss and no fuss. They started out with a beautiful box of these. I am helpless in the face of local fruits and veggies. It also gave me the chance to do one of my favorite tricks, which is to hull strawberries with a straw. Until you actually try this trick, it’s hard to explain how wonderful it is, so if you want to give it a go, click here for the particulars. Anyhow, the strawberry hulling is the longest part of the process. After you have your berries hulled and sliced, you need to make the super-quick cheesecake part of the parfait. Whipped cream cheese, vanilla yogurt, a little sugar and some vanilla…all you do is stir those together until they are nice and smooth and combined…and magically they form a taste sensation that is pretty dang close to cheesecake. Now take whatever pretty glasses you have on hand and sprinkle in spoonful of graham cracker crumbs. Now a layer of berries, then a layer of cheesecake mixture. Repeat the layers and then top with a couple of berry slices, just for the prettiness. You can now dive right in, or you can pop them in the fridge and save for later in the day. Personally I like the texture better right after they are finished, but the Southern husband liked the firmer chilled down version. 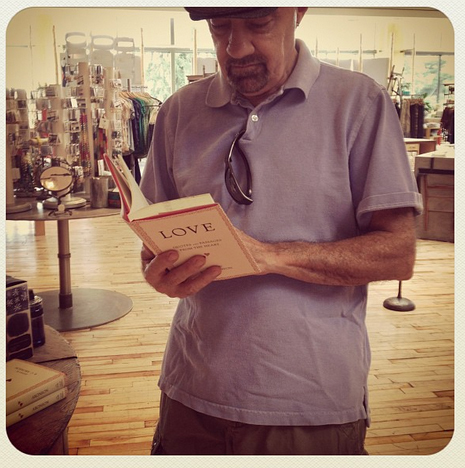 I guess this is one of the reasons I love him so – the whole “opposites attract” thing, and the fact that he waits patiently in Anthropologie while I browse for hours amidst the embroidered aprons and maxi skirts. That in and of itself deserves a strawberry cheesecake parfait, don’t you think? Me too. Here’s the recipe! Mix cream cheese, yogurt, sugar and vanilla together with a fork until smooth. 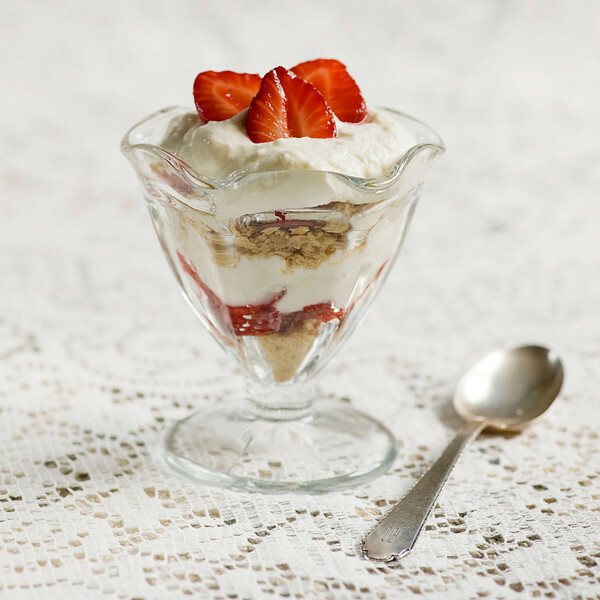 Assemble parfaits in glass parfait dishes or wine goblets as follows: a generous spoonful of graham cracker crumbs, a layer of berries and a layer of cheese mixture. Repeat layers and garnish with a few strawberry slices. The parfaits can be eaten immediately or refrigerated for a few hours. I’m going to promise this to The.Boy and see if he’ll wait around in Anthropologie for me in exchange. If not…more for me. Win/win!! Would you believe I visited my local Anthroplogie, for the first time, last month? What took me so long? I got some great kitchen buys in the sales section, too. I don’t take hubs with me, though. He’d patiently wait, but I’ll give him a break. 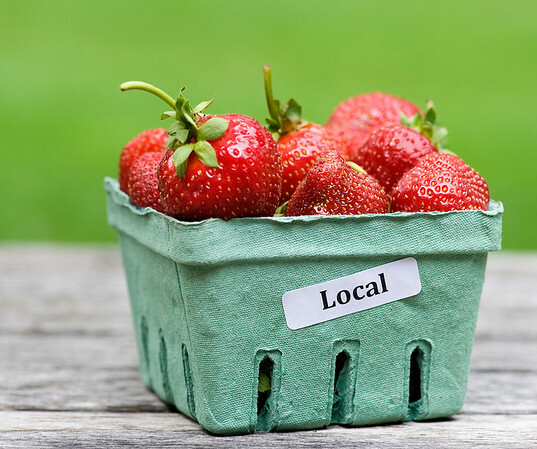 This looks so simple, and I know I’m adding this to my strawberry repertoire– soon! Uh-oh – now that you’ve been once you’ll always go back! They have the most adorable aprons ever…I keep getting new ones. Enjoy the parfaits! These are so easy to make. I love it. Thank you. You are so welcome – enjoy!! I think it’s appropo that you posted this on my birthday. yum! It was meant to be – happy birthday!! This was awesome! I altered the recipe slightly..
Used fat-free strawberry cream cheese, Plain Greek yogurt, 4 packets of Stevia Sugar and Cinnamon Crackers.. at the top, I threw on a little bit of fat-free whipped cream. The kids loved it! :) Thank you for it!